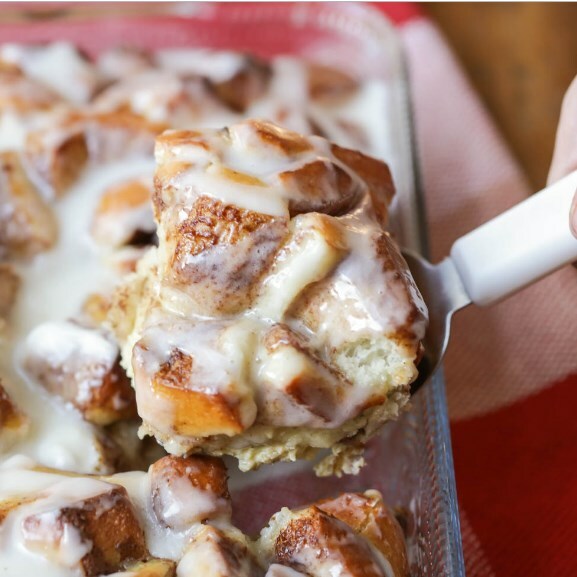 This Overnight Cinnamon Roll French Toast Bake Gives You All The Ooey Gooey Goodness Of Warm Cinnamon Rolls, With The Ease Of An Overnight Breakfast Casserole. It's The Perfect Breakfast Or Brunch Item During The Holidays! Consolidate the delectable solace of cinnamon moves amid the Christmas season without hardly lifting a finger of a medium-term french toast heat, and you get this impressive Cinnamon Roll French Toast Bake! With all the work done the prior night, you essentially get up in the first part of the day, exchange your dish from the fridge to the broiler, and in a matter of minutes, you and your family will appreciate the most astounding, hot breakfast! In a medium casserole or baking dish (we used 9x13), spray with non-stick cooking spray. Cut the frozen cinnamon rolls into quarters, and evenly spread into the bottom of the baking dish. In a medium bowl, combine the eggs, milk, sugar, vanilla, cinnamon and nutmeg. Whisk together well, and pour over the cinnamon roll pieces. Cover the baking dish with plastic wrap and refrigerate overnight, at least 6-8 hours. Rolls will begin to thaw and rise. Preheat oven to 375 degrees. Remove the plastic wrap and bake the French toast for 35-40 minutes or until the rolls are well browned on top. Remove from oven and frost with the cream cheese frosting from the cinnamon roll package (if desired). You can also top with your favorite syrup.